I am loving this little “storage” caddy I got a while ago at World Market. I loved the color and have used it for various things, but I am liking using it here a lot to store all my bathroom cleaning supplies. 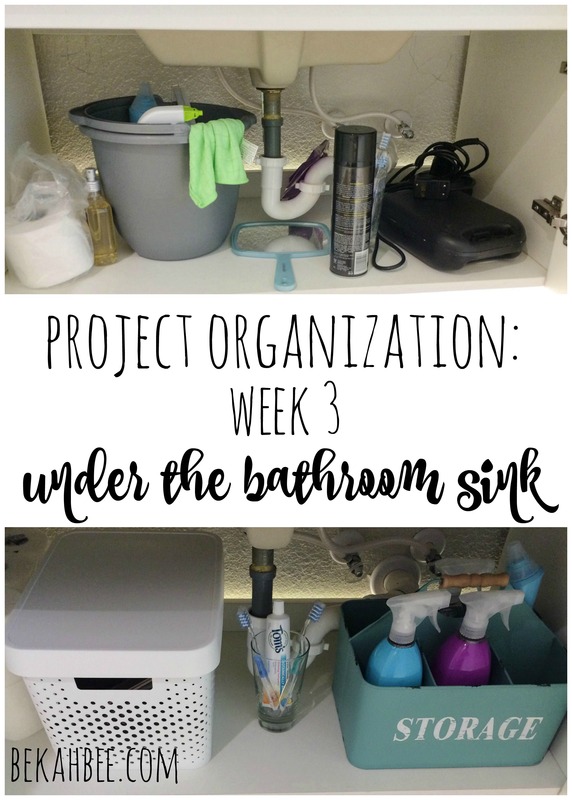 I wanted to make maintaining the bathroom as convenient as possible, with all the items easily at hand and not have to lug everything from under the kitchen sink every time I need to clean the bathroom. It has really helped me stay motivated to clean up more frequently so I need to deep clean less often. I also keep a roll of paper towels in the linen closet so I can take 2 minutes every day to just wipe everything down and I have been proud of myself for actually making it a habit, now I just do it automatically every day. Several extra rolls of toilet paper, not too far away from the toilet when we need to grab a new roll. A tall, plastic bin with lid for all of Chris’s hair supplies, including scissors, electric razor and hairspray. I needed a tall one because I wanted it to fit his hairspray in it and still have a lid to keep things uncluttered visually. Storage caddy with cleaning supplies. Looks soo much cuter than those plastic ones right? I actually did this organization project a little while ago, and have done pretty well at keeping it looking exactly like this! I feel like that is the true test of successful organization, that it it is truly practical and functions well afterwards. With a little use, you can usually determine if you need to tweak things a bit to get it just right.